There’s no denying it looks amazing, the kids will be constantly asking to fill their own glasses of water and the hand washing battles will be over. Yes Babyologists, this temperature controlled tap light is now available in Australia! Three years have passed since we first mentioned this LED tap light way back in 2007 but it’s finally here! I love this gadget because of the novelty factor – who wouldn’t love to see water light up before their very eyes? Then there’s the safety aspect – I’m forever warning “be careful it could be hot” and so on. Furthermore, my kids would not be able to leave it alone, which isn’t so great for conserving water but absolutely fabulous for personal hygiene. 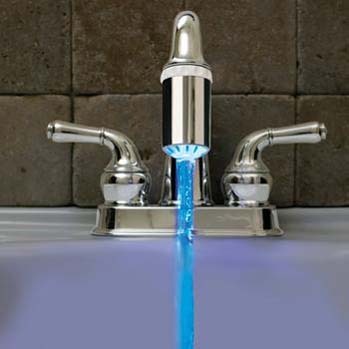 The tap light simply fits to your existing tap and glows blue when the water turns on. 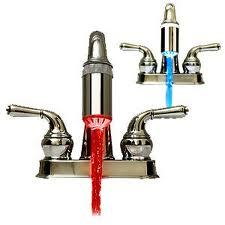 It switches to red when the running water hits thirty one degrees celsius, letting you know the water is getting hot. Great for kitchens and bathrooms, you can get yours for $29.95 from Toychable plus delivery.